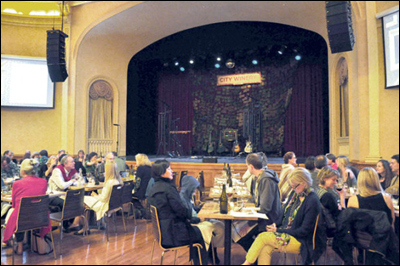 18 April 2014 - The curtain rose Thursday night on yet another rebirth of the 133-year-old Napa Valley Opera House. A Bruce Cockburn concert is two hours of lyrical and instrumental mastery. To an enthusiastic packed house, the 68-year-old Canadian folk legend graced opening night at City Winery Napa on Thursday with 20 original songs from 13 albums spanning four decades of celebrated work. He was an ironic vision as he strolled out to begin, the outspoken pacifist dressed black-on-black, his trousers tucked into high combat boots, looking about as military as civilian clothes will allow. This may be a simple fashion choice, but his artistic interest in the play of opposites, which runs through his entire body of work, makes me wonder. Cockburn combines lyrical imagery and complexity with stunning guitar work both as a very percussive rhythm player and as a soloist. For those unfamiliar with his repertoire, the songs can satisfy without interpretation on the sheer pleasure of the melodies and the performance. On repeated listening, he is drilling deeply into personal, political and spiritual themes. Most surprising were four sets of towering vertical chimes, two on each side of him, which he ignited with foot pedals while performing the six-string instrumental, “The End of All Rivers,” and an intense solo on “Stolen Land.” In the latter, a song raging against injustice, the chimes were church bells juxtaposed with the explosive guitar work. Opposites again. There were light moments. No Cockburn show goes without a sing-along on “Wondering Where the Lions Are,” his biggest commercial hit, with a call and response chorus likely to leave many an attendee with an earworm for a while. Cockburn is into his art, absorbed in re-creation. He is quietly appreciative of the audience's responses, dignified without being aloof, but seemingly with a healthy detachment from approval. My single quibble about the show was what was left out. Two fan favorites, “Pacing The Cage” and “Tie Me at The Crossroads,” didn't make the setlist. After a bit of muddiness at the start of the opening song, the new Meyer sound system performed beautifully, putting to rest concerns that the new configuration and flooring of the hall might be an acoustic problem. This concert was a big experience, immensely enjoyable musically, and challenging to the heart and intellect. City Winery is off and running. ~ from Napa Valley Register by David Kerns.